Gov. 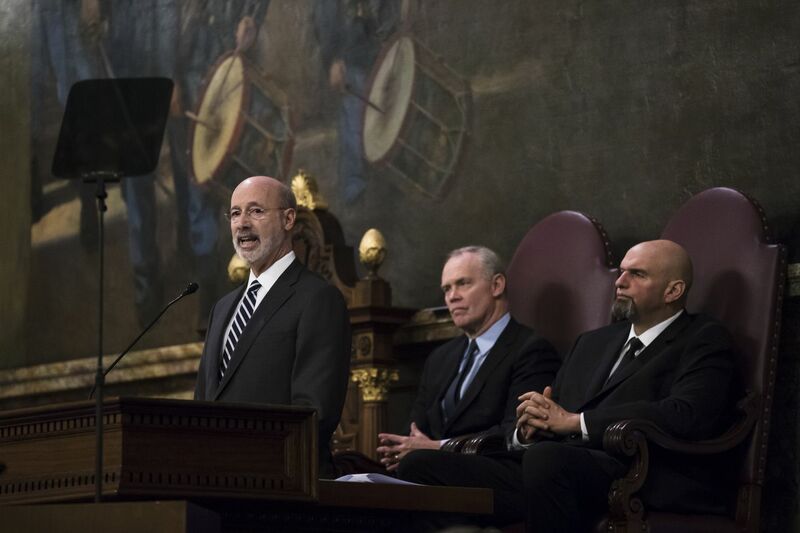 Tom Wolf (left) delivers his budget address to a joint session of the Pennsylvania House and Senate on Tuesday. House Speaker Mike Turzai, R-Allegheny, is at the center, and Lt. Gov. John Fetterman is at the right. County election officials have one word for Gov. Tom Wolf’s proposed Pennsylvania state budget and its $15 million for new, more secure voting machines. “It’s very disappointing,” said Philadelphia City Commissioner Lisa Deeley, a Democrat who chairs the election agency. “I am deeply disappointed in the numbers being proposed,” said Forrest K. Lehman, elections director in Lycoming County. “That was a bit disappointing today,” said Jeff Greenburg, elections director for Mercer County. The problem, they and others said, is that the proposed $15 million makes but a small dent in the estimated $125 million to $150 million cost for counties to comply with a state order to replace their voting machines by 2020 with modern, more secure models. Wolf is requesting that the $15 million continue for five years, for a total of $75 million, and a spokesperson said the governor is committed to seeing that staggered funding become reality while also working on other funding options. “We can’t bank on that. Let me put it that way,” Greenburg said. Budget politics in Harrisburg can be tricky and there are no guarantees. And officials said five years isn’t fast enough for some counties who are struggling to front the money to buy new machines now. Wolf’s Pennsylvania Department of State last year ordered voting systems replaced by the 2020 primary with machines that leave a paper trail of votes cast. County officials and election-integrity advocates applaud the goal of having systems that are less vulnerable to hacking and provide a tangible record of votes. They just don’t know how to pay for it. Right now, the only money available is a $13.5 million federal grant that required a state match of $674,000, for a total of $14.1 million. If the $15 million is approved in this year’s budget, that would leave about $95.9 million for counties to raise, with hopes that the state provides more money in the future. Marian Schneider, president of the nonprofit election-security group Verified Voting, said that Wolf’s budget request was inadequate and that instead lawmakers should come together across party lines and fund the new machines. J.J. Abbott, the governor’s spokesperson, said that the funding is divided over multiple years “because the administration is working with vendors on payment scheduling” and that Wolf, who has pledged to have state funding cover at least half the upgrade costs, would continue to find ways to do so. In his note to county officials, Marks asked them to continue advocating for funding with state and federal lawmakers. Officials said they would do that but wondered why the governor wasn’t doing more to help. “If this was really a priority of the governor, why didn’t he speak about it to the [General] Assembly? He didn’t do that,” Lehman said.